VietNamNet Bridge - Every year, 55 million tons of sediment is lost from the rivers in Mekong Delta, 90 percent of which is sand. Nguyen Huu Thien, an independent expert, said the Mekong Delta has been taking shape for the last 6,000 years thanks to alluvial accretion. But the volume of sediment in the river and canal system has decreased gradually, leading to an increased risk of landslides. The coastal provinces in the western part of the southern region are also directly affected by the change. The alluvium from river mouths to the sea has the function of protecting the coast, easing the impact from waves hitting the coast. When there is not enough silt, the sea water will cause erosion. Therefore, according to Thien, it is necessary to re-establish control over land exploitation to prevent the loss of natural resources. Every year, 55 million tons of sediment is lost from the rivers in Mekong Delta, 90 percent of which is sand. Research also points out the high risks that the Mekong River Delta is facing. A survey by the Mekong River Commission (MRC) found that in 1992-2014, the amount of suspended sediment in Mekong River valley decreased from 160 million tons to 75 million tons per annum. According to Marc Goichot, an energy and hydropower expert from WWF, the sediment depletion has relations with sand mining and construction of dams upstream of the Mekong river. The three upstream water reservoirs in China can retain 32-41 million tons of sediment a year. If all the terraces of eight hydropower dams in the upstream are built, more than 50 percent of sediment load in the Mekong basin, or 140 million tons, will be blocked every year. Meanwhile, the existing dams in the upstream now retain 35-45 million tons of sediment a year. Once all the dams are built, the figure will be 100 million tons in total. According to ICEM (International Centre for Environmental Management), every year, the total volume of sludge and sand deposited on the Mekong River section from Kratie Station in Cambodia to Vietnam’s Mekong Delta and to the sea is 12-18 million cubic meters. 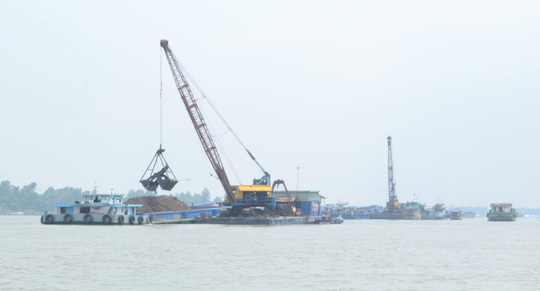 Meanwhile, the sand exploitation on Cuu Long River in Vietnam has deprived 28 million cubic meters of sediment the river, too much compared with the volume of 12-18 million tons. Duong Van Ni from the Environment and Natural Resources Faculty of the Can Tho University, also expressed concern about the sand overexploitation. “The sand in Mekong Delta needs hundreds of years of depositing to create the base of the riverbed, isles and fresh water containing layers. But the volume of sand drifting to the delta has been decreasing sharply in the last few years,” he warned.